THE WRITING BUDDHA - Opinions | Books | Movies: Unofficially Yours by Ayushi Jain (Book Review: 2.75*/5) !!! Unofficially Yours by Ayushi Jain (Book Review: 2.75*/5) !!! I completed reading a romantic novel after a long time and I can say that Sunday evening has been well spent with this book by a debutante authoress, Ayushi Jain. 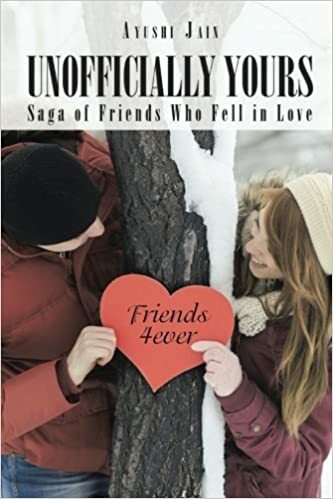 The name of the book is "Unofficially Yours" which comes with a tagline "Saga of friends who fell in love". I have seen such a good cover page, binding and the over all quality of publishing for any book after a very long time. Partridge publishers should be applauded for the great work done with this novel. The only problem is the size of the book which looks like a textbook of some engineering subject. It should have been of the standard size so that reading it while traveling could have been little easy. Well talking about the authoress, I would say that as a debutante, it is quite evident that she has been following several other Indian authors while writing this book as it's written almost in the similar fashion. And it is also evident that she is not a borne writer but because she had a story, she chose to share it with the world. I must say considering that, this book is surely a good attempt in terms of the narration. It's very easy and the way two protagonists are treated is really special. You can connect with them and their personalities very easily. I have little problem with the author for not involving other characters in the story which makes the purpose of introducing almost 15-16 characters in this book a wasted effort. The way parents of both the protagonist and also the sister is discussed is nice but what about friends and Priya's husband etc? Author should have given little more time in developing sub-plots for those characters too. The first half is more about how the whole group named "Gyaanis" enjoy their adventures and thrills. They have a rule that no one in their group should get committed among themselves. But the entrance of Arohi in the group changes it as Rajveer falls in love with her. She keeps reminding him of the rule but he keeps telling her that everything is justified in love. Finally both of them falls in love but parents come in between and spoils the whole affair particularly in the second half of the book. The Gyaanis also leave both of them alone which changes the whole scenario of the story. And then the book takes a Bollywood-ish turn which I found quite silly. I liked the simplicity of the book and the narration. I also liked few conversations between the character after they fall in love with each other. Author has also managed to describe different locations very wonderfully in the book. It seems as if she wanted the reader to imagine him/herself at the spot while reading those segments. The chapters are also divided well. Coming to the drawback of the book, I would say that few grammatical and basic mistakes are a real disappointment. A professional editor could have helped this book become more crisp and perfect. I found it very silly to find the female protagonist always reminding the boy about the rule. Like who does this in today's world? Rest, I would say as a debutante, this is a fine attempt and a light read which will be a great companion while traveling. I give this 2.75* out of 5.